Our next generation of Mal puppies are here. 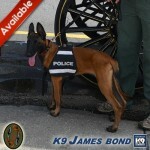 K9 James Bond He will be trained for patrol dual purpose, trailing and detection. He is available to law enforcement and SAR. We just started his trailing training and this will not be complete until he is 10 months old. At that time we begin his detection work.